Today's recipe is for the most daring ones! Specially in the heat wave we are suffering here... I can't promise it will be easy, or fast. I can say that the result is refreshing and delicious though! A few days ago, my friend Judith brought me a tupperware with the prettiest cherries I have ever seen. They were big, almost black and super juicy. I forbid myself to eat them all at once and I thought of doing a curd with them. If you do not feel like doing macarons in the summer (I totally understand, only a crazy person like me would do it in this heat), the cherry curd can be used in a lot of deserts. You can eat it in your yogurt, or as a topping for a nice vanilla ice-cream, or on your breakfast toast as well. Three days before you make the macarons: separate the whites of three eggs and place them in an open container in the fridge, without covering them. Mix the almond meal and the confectioners sugar and triturate it in the food processor for some minutes and sift it. Beat the whites until they reach a fluffy consistency. Add the granulated sugar while beating until they are glossy and opaque, and they form peaks. Add the food coloring and mix carefully with the spatula, from bottom to top. Add the almond meal and sugar mix little by little. You should do it in 4 or 5 times, always mixing carefully with the spatula with movements from bottom to top, in order not to deflate the whites. Once all the ingredients are incorporated, pour the mix in a pastry bag with a round tip. Make circles with the mixture, about a little less than 3cm diameter. It's better if you have done yourself a template with the circles drawn, so you can put it under the parchment paper. Once you have finished piping the mix, hit the tray on a flat surface three times. 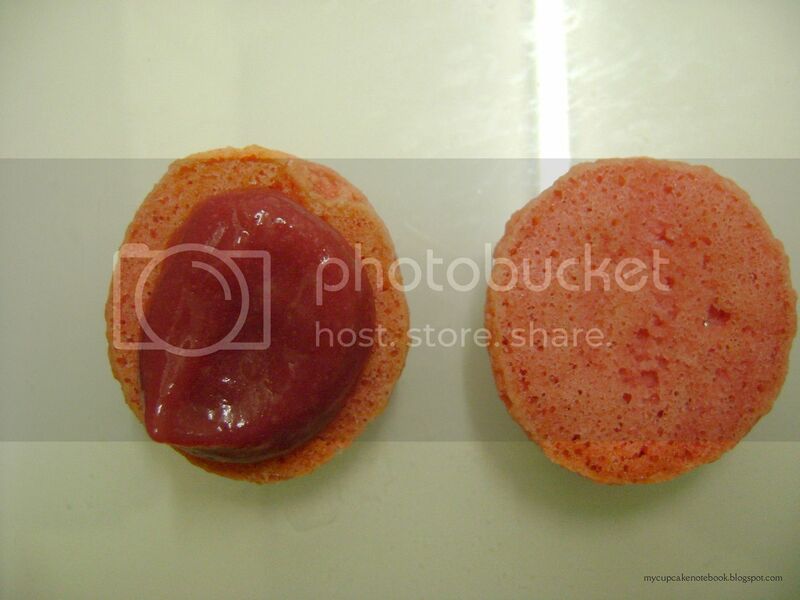 The air inside the mix in the macarons will come to the surface, puncture the bubbles with a toothpick. Let the macarons sit until the surface has dried (you can test it by lightly touch them with your finger- it must come out clean). They can be done in 20 minutes or 2 hours, depending on the humidity of the ambience. 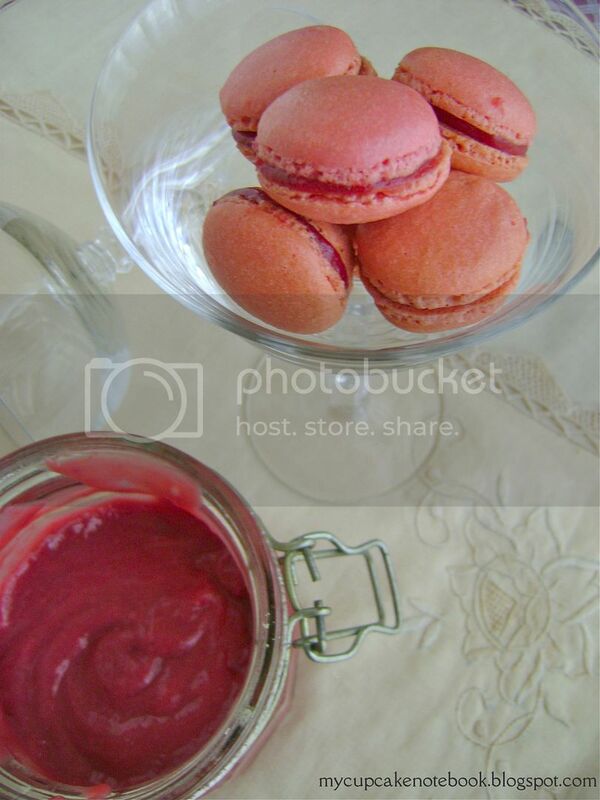 You must wait, however, otherwise the macarons will not rise when baked. Preheat the oven at 160ºC (320ºF). Bake for 15 minutes. After this time, open the oven door and, carefully so you do not get burned, touch the upper part of one of the cookies. If the top can be slide off the bottom, let them bake for 5 more minutes, testing them again after. The baking time will depend on the oven and the temperature. It is better to let them cook longer than to rise the temperature too much; I have baked them for a little more than 25 minutes. Take them out of the oven and let the parchment paper slide off the tray onto the table or the kitchen marble. Wait for them to cool down completely before peeling them off the paper. Match the cookies by size. Put a teaspoon of curd on one of them and put the other half on it, gently. Twist the halves until they are separated only by some millimeters. 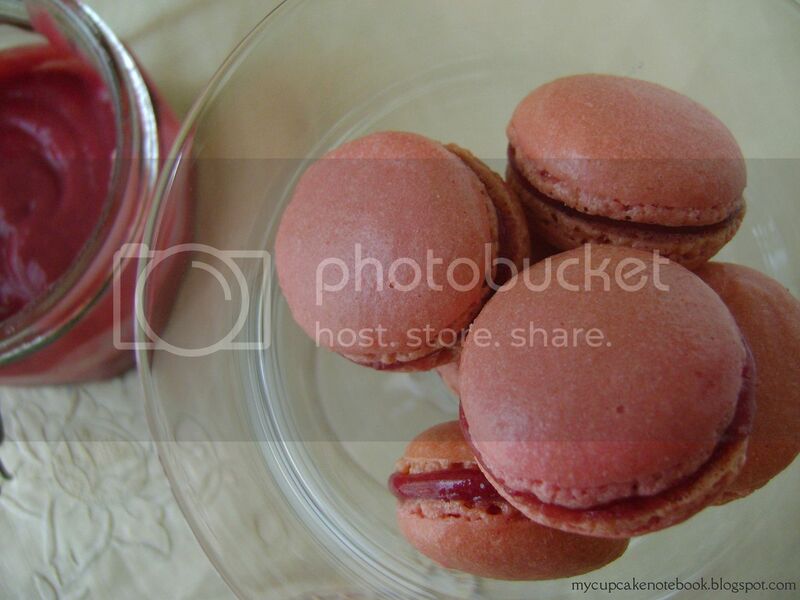 Let the macarons sit in the fridge, in an air sealed container for at least 24 hours before serving. 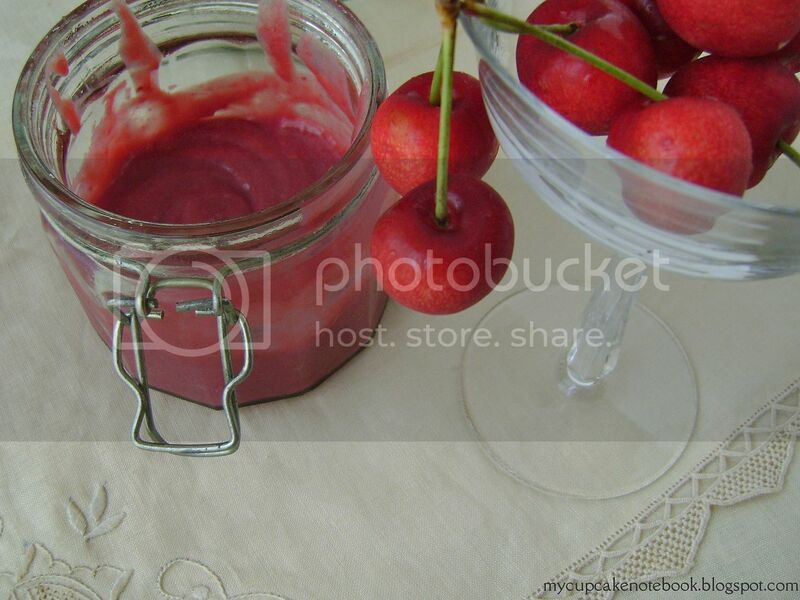 Combine cherries, sugar and lemon juice in a pot, at medium heat until it boils. Cook for two more minutes and set aside. Let it cool down for five minutes. Triturate the mixture and strain and discard the solids. In a bowl, beat the egg yolks. Add the cherry puree little by little while stirring. Pour the mixture in the pot at medium heat. Add the butter and stir until it dissolves. 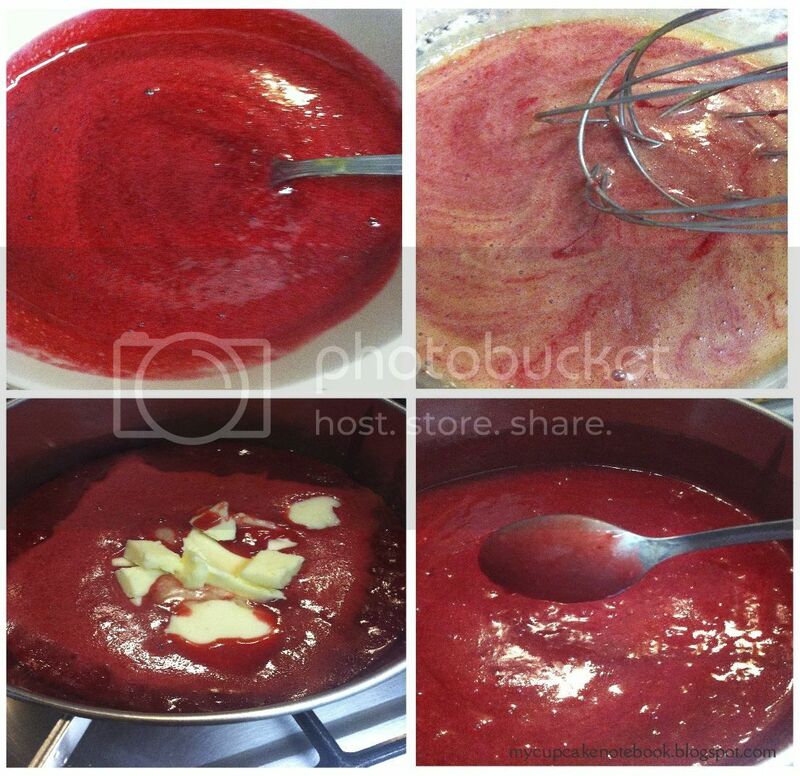 Stir while it cooks and set aside when the back of a spoon stays coated in the mixture when dipped in it. 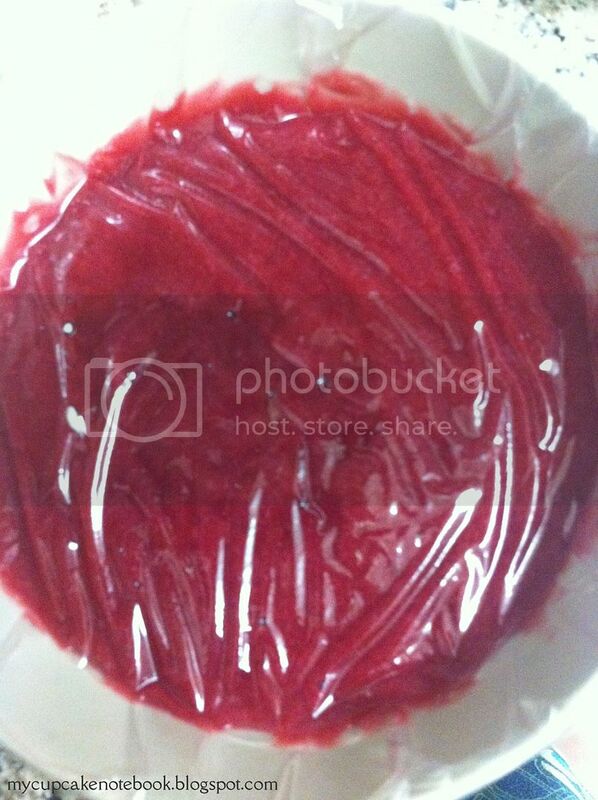 Pour the curd into a bowl and cover with plastic wrap tightly, so the plastic touches the curd and it does not create a crust. Refrigerate for 2 hours before using.